I have a Mills 10 cent diamond front. This is my first machine. It seems to be running very slow. Is there anything I can do to speed the timing up? Sorry if this has been asked before. Rledonne wrote: I have a Mills 10 cent diamond front. This is my first machine. It seems to be running very slow. Is there anything I can do to speed the timing up? Sorry if this has been asked before. 1.) 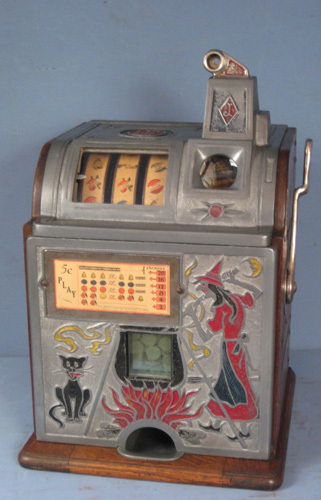 Congratulations on getting yourself a bona fide vintage slot machine, and welcome to the forum! 2.) Get a small brush (such as an artist might use) and some light oil (such as "3-in-1") and apply lubrication to the moving parts at their pivot points; over time, old grease can become more of an impediment than an advantage, but it can be refreshed a little with a bit of oil. 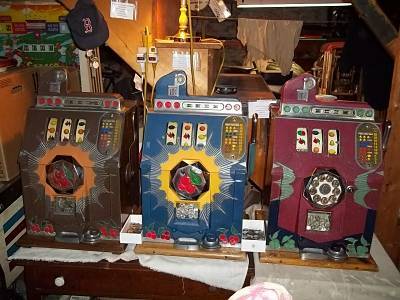 I've seen machines as old and crusty as an Egyptian mummy spring to life-- almost like new-- with just a little oil. BUT be very careful not to overdo it, and to avoid any areas where your applied lubrication could come into contact with the coinage; particularly and especially, do not get any lube into the coin slides, which you'll find at the lower right front of the mechanism, just underneath the coin tube. Contact with even the lightest oils can cause coins to get "sticky" and foul the payouts, escalator operations, etc. You're welcome! But, I forgot to mention: if your machine appears sluggish on account of the reels barely spinning, there are parts that specifically influence that. Look for the reel brake wires, which you'll find in a row across the middle-rear of the mechanism, held in place and tensioned by wingnuts. These wires ride the reel hubs and their purpose is to smooth the reel stop action, to prevent an ugly shock to the mechanism which can result when a very fast-spinning reel is suddenly jammed to a halt by the reel stop. Try loosening the tension on all of these wires by adjusting those wingnuts and then see how your cycle looks; you may see fit to selectively re-tension them if any of the reels keep spinning too fast and then stop in an objectionable, "herky-jerky" sort of way. Also, rather than bending the clock fan, I'd try cleaning the clock. If I recall it comes off fairly easily and can be degreased in a small container either by soaking or spraying, and then re-lubricated with light oil. I use penetrating lubricant like WD-40 or in severe cases Liquid Wrench, to unbind and test machines that are going to be broken down and re-lubricated before long anyway. It's best to hand apply it and not spray, particularly given the paper reels on a slot (unless the bundle is off), but it occurs to me that in the case of the clock, that's located in a corner of the mechanism where it would probably be possible to spray pointing away from the machine, or at least down towards the base, and draining onto newspaper. Of course you're right: that's the proper thing to do in the course of a full-on mech restoration... but I sure didn't want to scare-off a beginner by even suggesting anything like tearing down or removing parts from his machine right off the bat. From his words, it sounds like his slot is cycling OK, just not very enthusiastically, so I suggested proceeding very easily and gently by limbering up the old lube a bit (for the clock too) and seeing how that looks. Your suggestion to release the brake wires, stop the clock and spin the reels manually is also the perfect way to spread some refreshing light oil into the reel shaft, too. If it turns out his mech is so far-gone or corroded that it truly needs more invasive efforts, then, again, I agree with your approach 100%. My Bursting Cherry Blue reels were sluggish. I pulled out the reel shaft and cleaned & oiled it, but it was also worn. After reassembly, it was better, but not great. I replaced the shaft with a new piece of chrome plated stock the same size, and oiled it with 3 in 1. It works great now, and I had to tighten up the brake wires to slow them down. Check the shaft for straightness and wear. marsonion wrote: Of course you're right: that's the proper thing to do in the course of a full-on mech restoration... but I sure didn't want to scare-off a beginner by even suggesting anything like tearing down or removing parts from his machine right off the bat. From his words, it sounds like his slot is cycling OK, just not very enthusiastically, so I suggested proceeding very easily and gently by limbering up the old lube a bit (for the clock too) and seeing how that looks. Your suggestion to release the brake wires, stop the clock and spin the reels manually is also the perfect way to spread some refreshing light oil into the reel shaft, too. If it turns out his mech is so far-gone or corroded that it truly needs more invasive efforts, then, again, I agree with your approach 100%. And you're right - having grown up tearing mechanisms of various sorts down, I forget that not everyone is ready to dive into such things. What do you think of the idea of, say, tipping the machine back a bit on some newspaper, spraying the clock down with something like WD-40, and letting it drain, as a way to try to clean and temporarily lube it? The last couple of machines I've worked on had very sticky old grease on the axle and hubs, so I don't think that the reels would have spun properly until those were pretty thoroughly cleaned. Was that atypical, or could it have been addressed by letting something like WD-40 or even Liquid Wrench soak in longer? JPCass wrote: And you're right - having grown up tearing mechanisms of various sorts down, I forget that not everyone is ready to dive into such things. Since the OP hasn't responded in over two weeks, I'm afraid I may have scared him off regardless. marsonion wrote: Since the OP hasn't responded in over two weeks, I'm afraid I may have scared him off regardless. It seems that it's a bit of a challenge to come up with the best recommendations for initial troubleshooting and temporary measures to try to get a slow old mechanism going. I was only asking about WD-40 as a possible interim solution, to try getting a clock going that might be gummed up and running slow, before pulling it off to clean and lubricate properly. I think it has some potential use in initial troubleshooting like that, because it's more likely to loosen up old lubricant than just fresh lubricant. But WD-40 typically comes in spray cans, while on a slot mechanism it needs to be applied as a liquid except for the clock, where it might be possible to spray in a direction so that excess went away from other parts. I would have suggested trying the same thing except with degreaser, but that would leave it dry and require going back and lubricating all the necessary points on the clock.